1, Each dormitory holds a diner, food court, convenience store; these provide students with all their usual daily needs. 2, Each floor has its own coin-operated washing machine, heat-based dryer, and motion-based dryer. In addition, each floor has a space for manually drying clothes. 3, Each floor (division) is provided with a saloon, which may be used to watch television or hold discussions. 4, Each dormitory is assigned a faculty and a self-governed committee to address student needs. 5, The university’s center for safety daily rotates qualified personnel to guarantee campus safety and provide aid in emergency situations. 7, In order to call other rooms within the dormitory, directly dial the number of the room. 8, In order to make a call to the dormitory, dial (07) 615-8000 before dialing in the phone number of the requested room. 9, 600 units of free air conditioning are provided. Additional units may be purchased at the General Services Office (located on the first floor of the Administrative building), whereupon air conditioning will be activated for your room’s system. For more information on air conditioning units, please visit http://supply.dorm.stu.edu.tw/ . 10, For information on dormitory internet usage, see http://dorm.stu.edu.tw/index.php, where one can find internet bandwidth-exceeding actions, restricted websites, and commonly seen viruses. 11, For any broken appliances or furniture, please visit the School Information System, fill out repair orders (General Information Management  online repair). If you are unsure how to fill out a repair order, please seek assistance from the assigned faculty or the floor resident assistant. 1, Air conditioning may be turned on from noon to 2 PM, and from 7 PM to 7 AM. 2, Lights within dorm rooms may be turned on from 5 PM to midnight (this rule is not enforced during exam times). 4, Non-dormitory residents are restricted from entry between 10 PM and 8 AM. This rule is strictly enforced. Also, men are restricted from women’s floors at all times. Violators will be punished accordingly and their parents will be notified. 5, Smoking, drinking alcohol, cards, loud noises, using power-intensive appliances, and dangerous substances and items are prohibited in dormitories. 6, Pets of all kinds are prohibited in dormitories. 7, It is prohibited to take community appliances for private use. 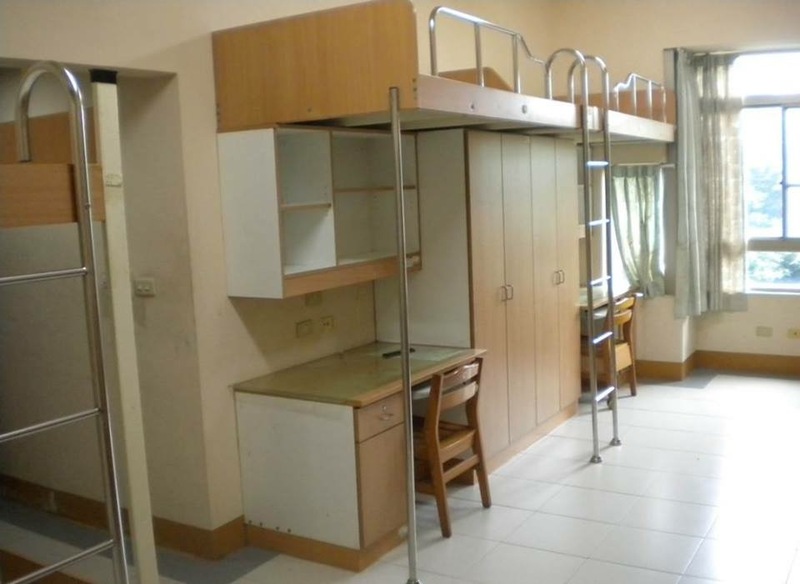 Please treat the furniture and appliances inside the dormitories with respect; do not add graffiti, nails or adhesives on walls, cabinets, surfaces of desks and doors. Violators will be required to return the furniture to their original positions and/or be required to pay a fine for the damages. 8, Do not replace the default beds. Violators will be ordered to move the original beds back to their positions in addition to being punished accordingly. 9, Please take care of your personal belongings and money to prevent theft or loss. 10, Please separate garbage by type, and place recyclable trash in the designated bins. 11, Please turn off electronic appliances that are not in use, and do not lower air conditioning to below 25°C, and regularly clean their filters. 12, When communal property in the dormitories are damaged, please send a repair order to the school system. For internet-related issues (including malfunctioning network jacks), please request assistance from the Computer Center’s counters. 13, At the dormitory front desk, in order to requisition first aid kits, safety helmets and carts, please bring identification. 14, Retrieve care packages and registered mail from the university’s Document and File Division (Basement floor 1 of the Administration Building). 15, For those returning to the dormitories after midnight, you are required to bring proof of your identity as well as identifying your room, in addition you are required to sign a late return registry. 16, Management take attendance for each week every Friday, those who have not been accounted for too often have their parents notified. 17, Rooms will be randomly inspected for unauthorized personnel and substances (banned substances will be confiscated and not returned), please be cooperative! 18, Inventory will be taken of communal property during opening and closing days of the dormitories, please thoroughly and honestly take inventory! 19, When applying to end your stay at the dormitory, please take an exit form from the dormitory front desk, and parents’ affidavit. Please turn in the form along with keys and swipe card when leaving the building; if retrieving your security deposit, (please bring your receipt). The university will inspect your room for damages. Please remove any personal belongings prior to leaving; any belongings found afterwards will be disposed of, and a fee will be deducted from your security deposit. 20, Those who break the rules of dormitory life and lose five points or more will have their parents informed; upon the loss of ten points, offenders are required to move out of the dormitories without their safety deposit. Please maintain close contact with the committee and the assigned faculty, in order to prevent misunderstandings and violation of individual rights!